The Bialetti Stovetop Expresso Maker is a high maintenance expresso maker that still manages to make itself worth buying and using. 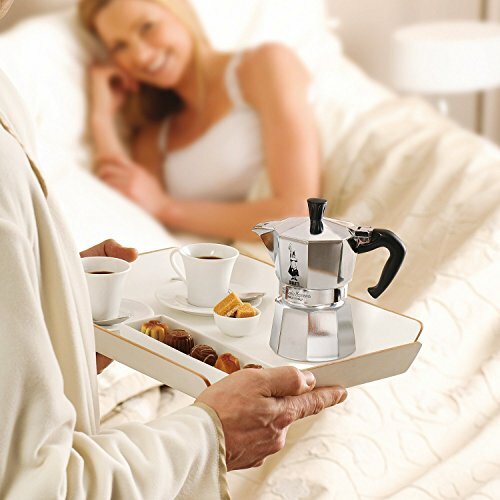 Bialetti Stovetop Expresso Maker: Is it Worth it? Before going over what makes this expresso maker high maintenance, let’s go over some quick facts about it and a brief history on the expresso maker itself. The Bialetti Stovetop Expresso Maker is also called a Bialetti Stovetop Mako Express, but for the sake of clarity I will refer to it as the Bialetti Stovetop Expresso Maker. The Bialetti first come out with their stovetop expresso makers in the 1950s and it is still a popular product to this day. There are three different sizes that you can buy a Bialetti Stovetop Expresso Maker: a 1-cup, 3-cup, 6-cup, 9-cup, and a 12-cup. 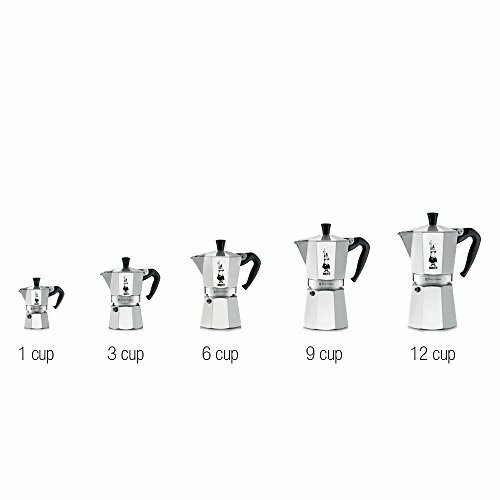 The 6-cup Bialetti Stovetop Expresso Maker is the most popular out of the different of sizes. The size of the cups for this expresso maker is actually smaller than what one would assume. This is because the cups are demitasse cups with each cup being equal to 2 ounces rather than 6 – 8 ounces. If you want to buy this expresso maker to make one to two individual cups of coffee I would not recommend buying one that is smaller than the 6-cup Bialetti Stovetop Expresso Maker. But for someone that plans to use it to make expressos the sizing of the cups is perfect. An informative card on the different recipes that can be used with your freshly made expresso is even included with the expresso maker. 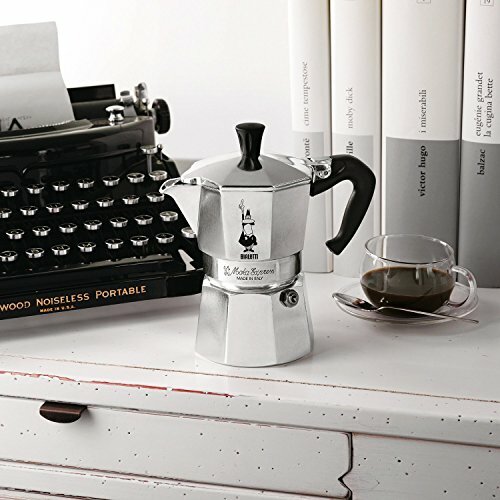 It has been pointed out by several members of the online coffee brigade that the Bialetti Stovetop Expresso Maker does not actually make expresso but rather a strong coffee. So even with the informative card on expresso drink recipes you can decide to make a pot of “strong coffee” instead of expresso. When you are grinding coffee beans for this coffee it is recommended that you should use a grind that is slightly coarser than what is used for expresso. Yet at the same time several members of the online coffee brigade have brought up in their reviews that their coffee has turned out fine with grounds that are as fine as expresso or even with a regular ground. I personally prefer using regular grounds so I had to adjust the amount of grounds used to accommodate my preference. So even though it is recommended that you use a grind that is slightly coarser than an expresso grind it is ultimately up to you to decide which grind to use. I would recommend that you adjust the way you make your coffee with this expresso maker. Everyone loves a good cup of coffee, and a good cup of coffee tastes even better when it is made without a lot of rigmarole. 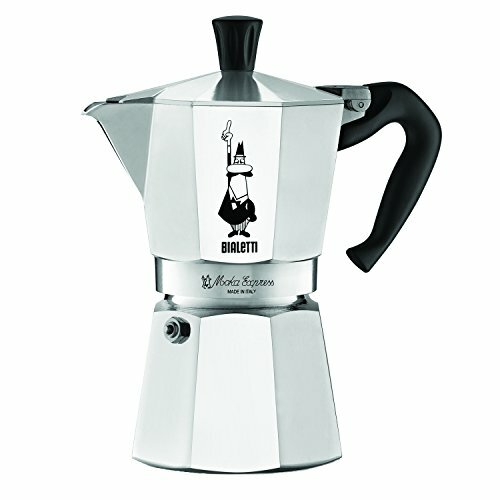 The Bialetti stovetop expresso maker once you get familiar with it will easily make a good cup of coffee. However, there are several things that you must do to make sure that you consistently make a good pot of coffee without it being ruined through use. You need to clean it in a specific way after each use to prevent the development to corrosion of aluminum. You also need to consider that it should be seasoned first before using it to make pots of coffee to drink. Instructions on how to use the Bialetti Stovetop Expresso Maker are not included in the box so you need to find instruction videos online to learn how to use it properly. When I first got my Bialetti Stovetop Expresso Maker the lack of instructions being included was one of the first things I noticed about it. Fortunately, there are several YouTube videos explaining how to use the expresso maker. To make it easier in finding an online tutorial on how to make coffee with a Bialetti Stovetop Expresso Maker I have included a video for the new user. Even with all the online YouTube videos on how to use the expresso maker I did not know until recently that it is recommended by Bialetti that you season your expresso maker using three throw away pots of coffee before you actually start using it for coffee. Unlike with other coffee makers that come included with instructions, with the Bialetti Stovetop Expresso Maker you have to search online for instructions and guidelines on how to use and make a good cup of coffee with it which can be a bit daunting for a first-time user due to all the information online. The Bialetti Stovetop Expresso Maker is made of aluminum and because of this should be cleaned differently. The official Bialetti website says to clean it by hand with warm water and to dry it with a clean towel. It is also recommended on their site that you do not use abrasive cleaning equipment, soap, or detergents when cleaning your expresso maker. If do you use one of these to clean the expresso maker you run the risk of causing aluminum corrosion in your expresso maker. However, as one member of the online coffee brigade brings to light in their review even while following the guidelines corrosion can still occur. Another thing I noticed about the expresso maker after first opening is it was covered in oil. The Bialetti website encourages its customers to season their expresso maker by making throw away coffee in it three times. One of the members of the online coffee brigade in their review brings this up with their explanation of how they “made three pots of coffee to throw away to clean the pot a bit, but there was still a foul taste when I brewed the fourth pot. I ultimately needed to clean the pot with soap and water to clear the oil which was coating the entire pot” (Click here). As stated before I did not know that I was supposed to make three pots of throw away coffee so I did not know of the significance of the oil covering the expresso maker and rinsed it off before making my first pot. Despite this the expresso maker still manages to make good coffee without having been seasoned first. If you are okay with all the maintenance needed to maintain it and consistently make good pots of coffee with the Bialetti Stovetop Expresso Maker it is definitely worth the money used to buy it. There are several reasons why it is worth buying even with all the maintenance needed for it. One of the primary reasons is that it can consistently make good to great pots of coffee. There is also the relative quickness that it makes a pot of coffee. I am sure that I can confidently say that I am not the only one who really enjoys a great cup of coffee. The aroma. The taste. And the comfort in sipping on great coffee. Those are some of the joys in a great cup of coffee. One you have perfected using the Bialetti Stovetop Expresso Maker you can almost count on the consistency in the coffee being made with it is great. I do admit that if you do not have much experience in using similar coffee makers then the first three pots that you make to drink will not be as great as it can be. And this has to do with adjusting the amount of grounds used to match your preference in coffee strength rather than the way the expresso maker makes the coffee. The Bialetti Stovetop Expresso Maker also is surprisingly quick in making coffee. The expresso maker can be used to make a pot of coffee from five to eight minutes depending on how low you have the heat. Much of this time is the water in the water chamber being boiled and you can even speed the process up by using already boiling water. Bialetti does not recommended this and suggest that you always use cold water to fill the water chamber in its stovetop expresso maker. Being able to make a pot of great coffee in a short amount of time is nice feature as you can have your cup of coffee that much sooner. In short, the Bialetti Stovetop Expresso Maker requires a bit more maintenance than one would normally expect for a coffee pot. If you are okay with buying a high maintenance expresso maker that can consistently make great coffee in a short amount of time then this is an espresso maker that it worth buying. If you do not care for the idea of hand washing with warm water and hand drying an expresso maker every time you use it and would rather clean it in a dishwasher instead then I would not recommend that you buy this. Previous Post: « How to Buy the Best Colombian Coffee Beans Every. Single. Time.